Beautiful, remodeled condo near South Coast Plaza! 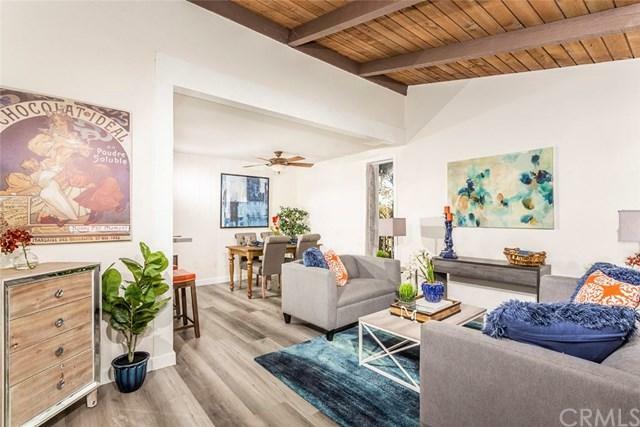 This great upper corner, inside unit condo has a beautiful vaulted ceiling with wood beams and has been cosmetically remodeled with the latest in designer colors and style. The flooring is a beautiful, distressed grey waterproof vinyl, complimentary grey quartz counters accented by light and bright, new white shaker style cabinets, new stainless steel stove, new sink and faucet and fresh paint throughout! The bath has a beautiful new vanity and quartz counter along with a space for a dressing stool or extra storage accented with a beautifully framed mirror. The master bedroom is spacious and features mirrored closet doors. This condo has a great location within the complex at the end of a lovely tree covered walk and overlooks the green belt/Park next door giving you great natural light. The guard-gated MacArthur Village is near South Coast Plaza, The Segerstrom Center, tons of shopping and the 405, 55 and 73fwys. This condo complex features 5 pools, 4 tennis courts, a gym, basketball and volleyball courts, jacuzzi+GGs and on-site laundry and covered, assigned parking. Hurry to see this fantastic condo before it+GGs gone! Sold by Melissa Hamik of Douglas Elliman Of California,.